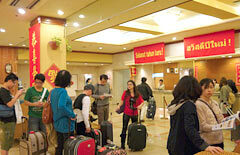 On January 30, at Pacific Hotel Okinawa in Naha, Taiwanese tourists came to Okinawa for the Spring Festival. Because of the long holiday of the Spring Festival (Chinese New Year) from January 30 to February 6, many tourists from Taiwan and mainland China came to Okinawa. They used international flights between Naha and Taipei, Shanghai and others during the holidays. The airline companies also plan to run many charter flights. Juneyao Airlines of China will launch a new route between Naha and Shanghai from January 31. The number of tourists from mainland China will be greater than last year. China Airlines, which runs 11 flights a week between Naha and Taipei, saw the flights fully booked until February 1. The rate of reservation after February 2 is also over 80 percent. During the festival, the company will temporarily increase return flights between Naha and Taipei by two and between Ishigaki and Taipei by two. China Eastern Airlines, which runs a return flight between Naha and Shanghai every day, saw the flights from Shanghai fully booked almost every day until February 3. The company will offer five more return flights during the festival. Juneyao Airlines will start services on the same route. Its reservation rate on the first flight from Shanghai was 83 percent. Asiana Airlines, which runs flights between Naha and Seoul, saw the rate of booking the flights from Seoul at 83 percent until February 1. The company will offer three return charter flights between Seoul and Miyako. Pacific Hotel Okinawa in Naha accepted about 1,200 tourists during the holidays. To create a festive atmosphere, the hotel will set up decorations and play music for the Spring Festival inside the building. In addition, they will hold a countdown event for the Chinese New Year.